Europe faces a range of environmental challenges that will impact on its future prosperity. Europe leads in innovative environmental technologies which can provide solutions while also increasing EU competitiveness. Breaking into the market with innovations can be a significant problem, because innovations by definition cannot show a successful track-record. Without credible information about innovative technologies, potential buyers are unsure whether or not to trust the claims made about their performance. In 2011, European Commission with 7 Member States  intends to launch a solution to address that problem: Environmental Technology Verification (ETV). It is an initiative that provides for third-party verification of the performance claims made by technology manufacturers in business-to-business relations. By issuing a Statement of Verification, which is the product of a successful ETV process, ETV provides credible information on the new technology. Market access for innovative environmental technologies is significantly enhanced and the technological risk for technology purchasers (whether private or public) is reduced. The ETV4INNOVATION project will create an Eco-Innovative partnership in six European countries (Ireland, Denmark, Spain, France, Bulgaria and Poland) formed by 6 partners: a cluster, with a strong relation with the technological sectors and the administrative bodies; a university specialized in teaching courses; a Verification Body of ETV; a Research Centre specialized in e-learning platform and green R&D project and finally, a SME specialized in green-technologies consulting and SMEs with products verified by ETV. The partnership will be set up with the goal of designing and developing an e-learning training course for filling gaps in relation with ETV for current and future managers and workers in technological sectors. Identify the lack of knowledge in the organisations to be able to manage and bet on ETV. Deliver the JCV on e-learning OER Platform and protect it under open licenses. Break borderlines among SMEs and large companies and experts in ETV, creating common procedures and skills. Equip enterprises with the right skills and knowledge for the ETV verification of today and tomorrow and fostering a sustainable technology process. Raise awareness of current environmental problems, the need to carry out a sustainable development, and bring more respectful practices with the environment. Comparative analysis and evidence-gathering, studies of examples of good practices, and real life cases of successful ETV verification already performed, etc. in order to identified skills needs and competences in the technological sectors required to successfully applied for ETV process. Development of a Joint Curriculum with the integration of different learning modes and innovative approaches. The creation of learning and training materials together with methods, pedagogical approaches and tools. The implementation of a training and collaborative e-learning platform to ensure that all the materials developed is certainly deployed by creating an open online course. Thus, the partnership will collaborate and work in ETV4INNOVATION with the aim to foster modernization and knowledge expansion aligned to the needs and opportunities offered by the increasing number of new eco-technologies by technology developers in relation with the technological field as water treatment, energy technologies, materials, wastes, etc. In addition, ETV4INNOVATION expect to extend ETV process to more European Countries, with the involvement of the different stakeholders and target groups identified. The project will carry out its own assessment, and a wide Dissemination Plan to spread its results among as many interested parties as possible. ETV4INNOVATION will also address transversal skills, such as entrepreneurship, green skills, and digital competences. Results will strengthen the education and training path of workers, equipping them with all necessary competences and skills to develop a high quality job in the target sectors (technological fields). То provide a complete analysis of the current skills and needs to improve the technological sectors towards Environmental Technology Verification. To develop and deliver online ETV4INNOVATION training curriculum for better skills and competences on ETV. To develop and deploy an E-learning platform containing ETV training materials. Europe faces a range of environmental challenges that will impact on its future prosperity. These include resource depletion, increasing water scarcity, air pollution, climate change and biodiversity loss. Europe leads on innovation in environmental technologies which can provide solutions, while also increasing EU competitiveness. However, breaking into the market with innovations can be a significant problem, because innovation by definition cannot show a successful track-record. Without credible information about innovative technologies, potential buyers are unsure whether or not to trust the claims made about their performance. In 2011, the European Commission with 7 Member States launched a solution to address that problem: Environmental Technology Verification (ETV). It is an initiative that provides third-party verification of the performance claims made by technology manufacturers. By using a Statement of Verification, which is the product of a successful ETV process, ETV provides credible information on the new technology. Market access for innovative environmental technologies is significantly enhanced and the technological risk for technology purchasers is reduced. ETV4INNOVATION is a two-and-a-half-year long EC funded VET Strategic Partnership project under Erasmus+ programme. It has been designed with the aim to support the development and the implementation of an innovative practice and a new training path in the field of Environmental Technology Verification (ETV). There is a very strong demand from buyers of innovative eco-technologies for performance guarantees. The Environmental Technology Verification (ETV) statement offers the only internationally accepted guarantee of performance for any eco-technology. As the new ISO 14034:2016 standard, ETV can provide eco-technology developers with a real competitive edge for marketing their products. As the ETV verification statement offers guarantees of the performance of eco-technologies, the process of obtaining ETV verification statements follows very strict guidelines and procedures. To obtain such statements rapidly and at the lowest cost, companies must meet the level of requirements of the ETV verification process at all phases of product development. ETV4INNOVATION is part of a global endeavour to provide companies that develop eco-technologies with an efficient and successful access to Environmental Technology Verification. ETV4INNOVATION aims to design and develop Joint Curricula for filling gaps in relation with ETV for current and future managers and workers in technological sectors as materials wastes and resources; energy technologies. More specifically, ETV4INNOVATION will develop open-access e-Learning modules aiming to help eco-technology developers gain an in-depth understanding of the ETV scheme, thus providing them with knowledge and resources to facilitate the procedure of obtaining ETV verification statements for the eco-technologies they market. Identify the lack of knowledge in the organisations (SMEs) to be able to manage and bet on ETV, which incorporates green requirements in the development of new eco-technologies. Design and develop a Joint Curriculum on ETV with the participation of stakeholders from the industry and experts from the green technologies topic, such as Verification Bodies, Clusters and Universities, and other with expertise in this eco-innovative verification (ETV). Equipping enterprises with the right skills and knowledge for the ETV verification and fostering a sustainable technology process. Promoting better anticipation of ETV skills needs and developing better matching between skills, companies needs, and European green requirements. Creating awareness of current environmental problems, the need to carry out a sustainable development, and bring more respectful practices with the environment. During the meeting Ms. Muñoz (CETEM) presented a short summary of the IO4-A1: Analysis, design and software development of the e-learning platform coupled with ideas how to create nteractive contents. Communication and dissemination aspects were also briefly presented during the meeting. 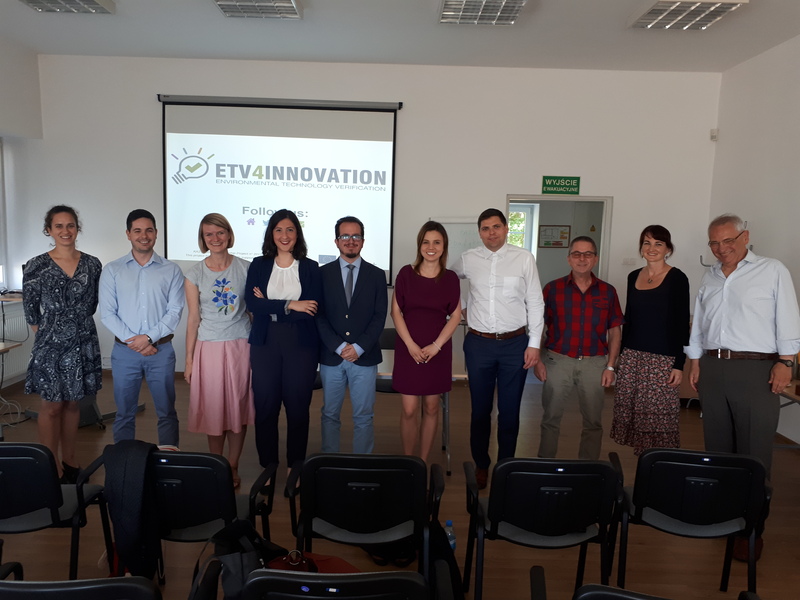 The second ETV4INNOVATION consortium meeting took place in Poznan, Poland on the 12th and 13th of June. The project meeting was hosted by the Polish project partner Instytut Technologiczno-Przyrodniczy (ITP). A major discussion took about IO1: Key study on general needs by SMEs towards ETV, where Mrs.Lina Kvasyte (INVENTYA) explained the first version of the report. Some conclusions of the current state of the report were also given. Another imprortant topic that was also discussed ware the results obtained from the second activity of the IO1 - the questionnaire. Brief summary of the findings from the questionnaire could be found under the Report of current needs and skills required towards Environmental Technology Verification. The second part of the first day’s meeting started with presentation by Agnieszka Wawrzyniak (ITP) providing ideas and possible structure of IO2 - the Joint Curriculum. 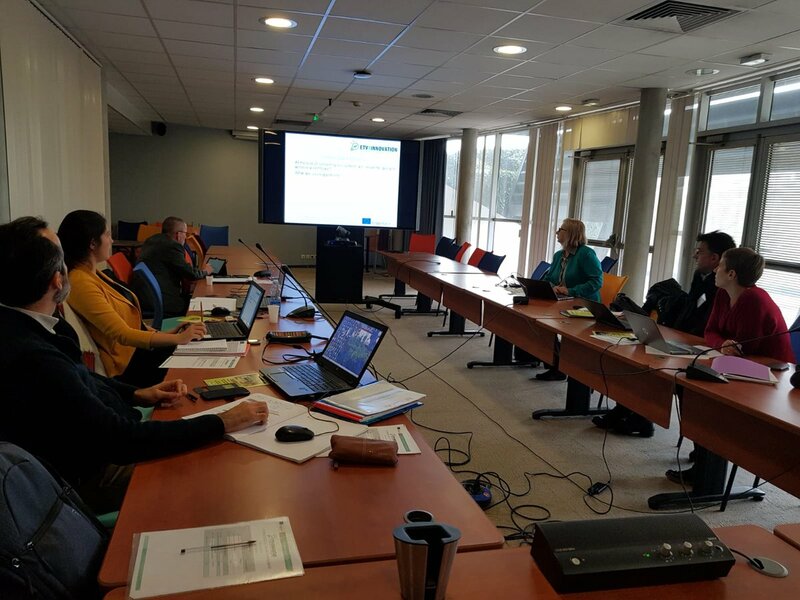 During the second day Mr. Petar Kisyov (GREEN SYNERGY CLUSTER) gave presentation on the current state of the art of the communication and dissemination activities within the ETV4INNOVATION project, which main goals are to ensure that the stakeholders know about the project. Different dissemination approaches were also discussed as the project to reach to a wider public. ADEME, the French Environmental Agency, has been commissioned by the Ministries of Environmental and Industry for the establishment and deployment of environmental technologies performance verification device by a third party expert (Environmental Technology Verification, ETV) base European Pilot Program launched by the European Union in 2011. The feedback, both European and French, is that many SMEs are showing interest in favour of a concrete project implementation of ETV approach. In 2017, ADEME carried out a study of SMEs and their interest in ETV. 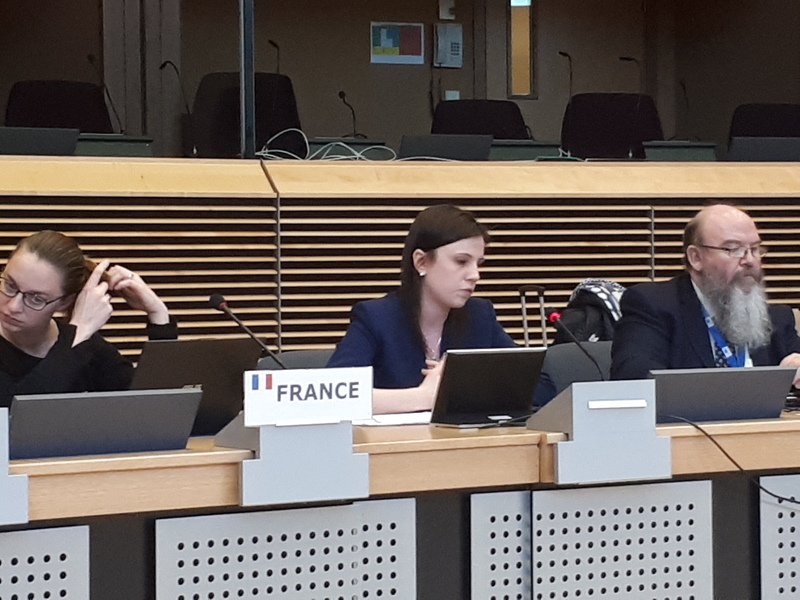 Some of the conclusions obtained by the French Agency were the need of an improvement in the communication on ETV with companies via the awareness of national support structures, the creation of a training module for future “escorts”, etc. This report has a wide quantity of common point with the report of ETV4INNOVATION Consortium obtained from the development of the IO1. The structure for the European ETV Pilot Programme compiles the interaction of different actors: technology manufacturers, SMEs, technology representations, etc. This post will be focused in the role of Verification Bodies which carry out the verification procedure of this new product or technology. A verification Body is an organisation accredited as fulfilling the requirements of ISO 17020 to perform verifications under the EU ETV Pilot Programme and complying to the requirements specified in the General Verification Protocol document (GVP). Each Verification Body is accredited for at least one subset of the specific technological areas included in the ETV pilot programme: materials, waste & resources; water treatment and monitoring; energy technologies, air cleaning and monitoring; monitoring and cleaning of soil and groundwater; cleaner production and processes. The Verification Bodies have the obligation and responsibility of reviewing and verifying the claims proposed by technology manufacturers in an independent, objective, impartial and confidential way. At the moment, there are 14 Verification Bodies located in the six countries involved in EU ETV Programme: Poland, Finland, Italy, France, Denmark, United Kingdom and Czech Republic. If your organisation is interested to become a Verification Body, it should contact the national accreditation body of their country. If you are an organisation from a country which are not involved in EU ETV Programme, please contact directly with the EC ETV contact. The European Environmental Technology Verification Programme (EU ETV Programme) has increased the number of products verified by ETV since its creation. Concretely, the last verified product has been manufactured by Nateo Sante. This French company specializing in indoor air quality has been developing, for several years, different ranges of air purifier. It offers professionals and individuals a solution for air purification against pollution in indoor spaces related to the presence in the air of different types of pollutants. The product has been verified by RESCOLL, one of the two Verification Bodies located in France. The European Commission and Directorate General organised the last February the 4th ETV Stakeholder Forum: Evaluation and Future of ETV in Europe. 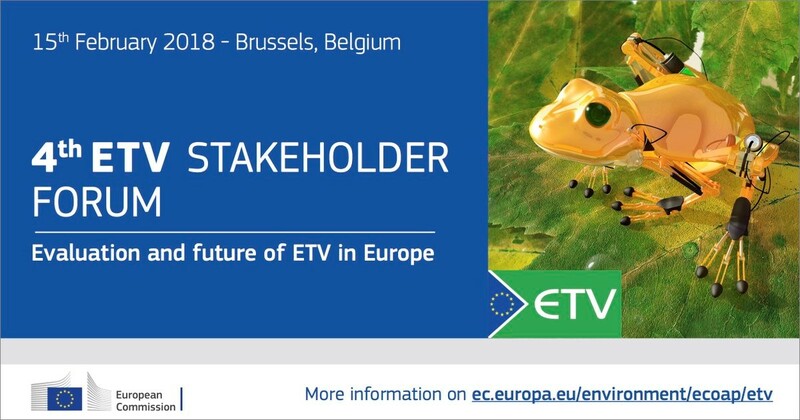 The European Commission created these ETV Stakeholder Forums in 2012 as a place where stakeholders interested in ETV can share views on the EU ETV pilot programme, advise the European Commission and Technical Working Groups on its implementation and contribute to its evaluation and way forward. In 2017, the EU ETV Programme decided to promote an evaluation to better understand whether it is achieving its desired outcomes and impacts after three years of actual operation. Specifically, the European Commission wanted to know if the current Programme meets the objectives set when launched and is functioning as planned, both in terms of the verification infrastructure which has been established, as well as the expected outcomes for innovators that are using the scheme. The results of this evaluation were presented during the Forum as well as an assessment of possible options for the future of an EU ETV scheme performed. More specifically, a robust system has been developed although there are only 26 technologies verified until the moment and a further of 40 are in the process. There a high value of initial enquiries, 1166, but the ETV should be more attractive in order to achieve more companies involved in the process of verification. Finally, the forum finished with some studies of feasibility as use ETV as proof of performance in the context of GPP policies or even turn ETV into an Innovative Technology Verification (ITV), among others. In April, 2018 the European Commission updated the EU ETV General Verification Protocol (GVP). The previous version, which was published in August 2016, has been updated with the integration of all relevant references to the ISO Standard 14034. 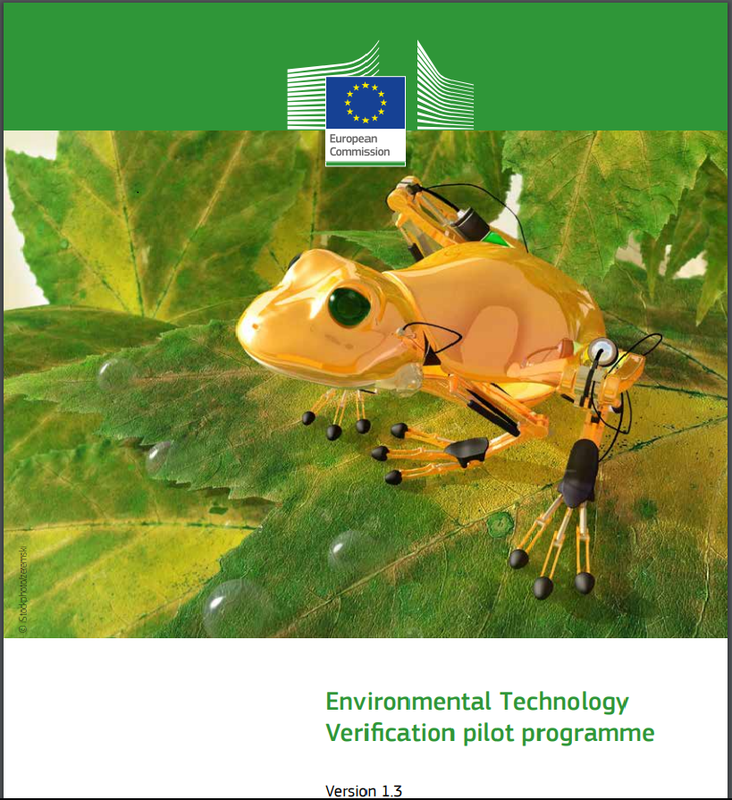 When the European Commission launched the voluntary scheme for Environmental Technology Verification (ETV) on an experimental basis through the EU ETV pilot programme, experts decided to create a document for supporting this initiative. This document is the General Verification Protocol (GPV) which has been created with the aim of supporting the development and implementation of ETV. The purpose of the GVP is to provide an organisational and technical framework and procedures enabling the provision of independent and credible information on new environmental technologies, by verifying that performance claims put forward by technology developers and manufacturers are complete, fair and based on reliable test results. At the core of a verification process under ETV, test results produced before or during the process are reviewed in order to assess relevant parameters for the performance of the technology. Mutual recognition of verification results is ensured in the European Union by following the procedures as laid down in this GVP. This 1.3 version integrates all relevant references to the ISO Standard 14034, ensuring that an ETV verification in the EU programme is also fully compliant with the ISO Standard for ETV. The ISO standard features specific sections on verification principles, accepted testing practices and reporting requirements, to help create a level playing field for technological innovators and encourage greater market acceptance of innovative technologies. 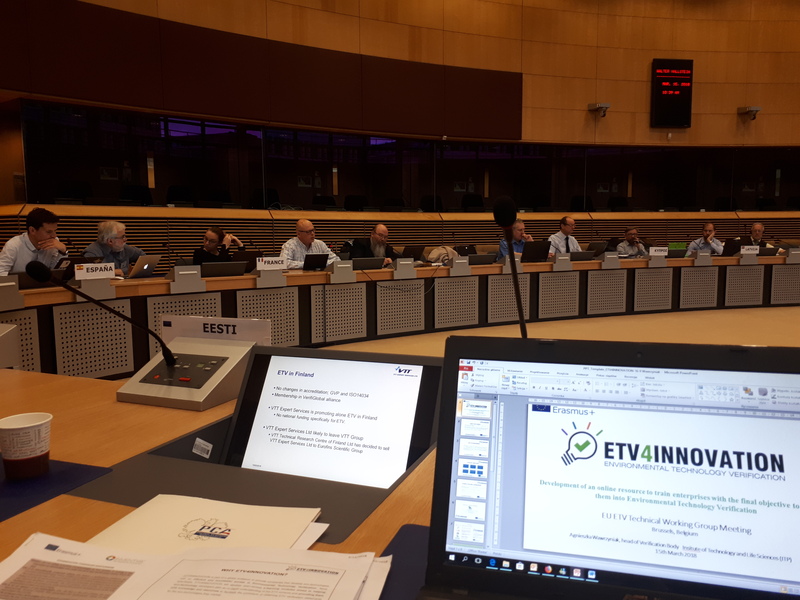 Mrs. Wawrzyniak from the Insitute of Technology and Life Sciences, Poland presented ETV4Innovation project during the 12th Environmental Technology Verification (ETV) technical working group (TWG) meeting held in Brussels on 15th March, 2018. During her presentation she outlined ETV4INNOVATION` main objectives, e.g. development of open-access e-learning modules aimed to helping eco-technology developers gain an in-depth understanding of the ETV scheme and providing them with knowledge and resources to facilitate the procedure of obtaining ETV verification statements for the eco-technologies they market. 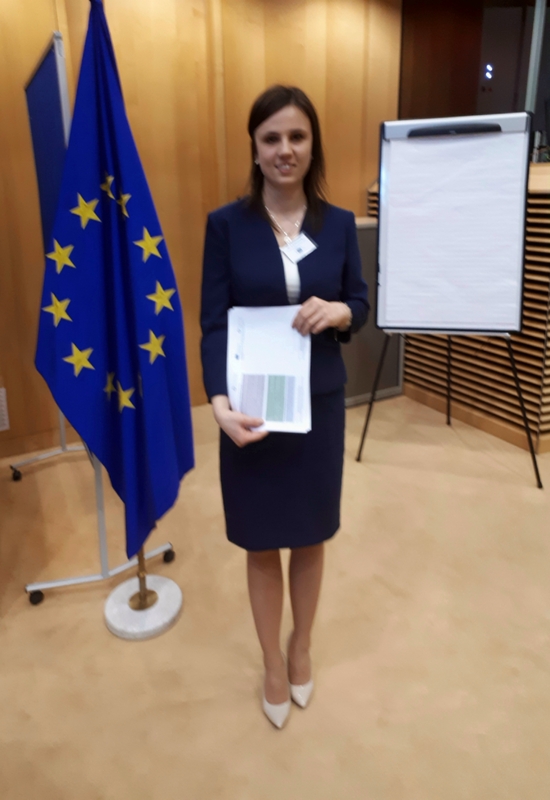 Mrs. Wawrzyniak also presented information on the current state of the art of the project Intellectual Output 1: Key study on general needs by SMEs towards ETV, where a targeted Questionnaire is currently implemented within a number of SMEs and stakeholders in participating countries – Bulgaria, Denmark, Ireland, France, Poland and Spain. If you are interested, please contribute to our Questionnaire for the SMEs operating in the eco-technology field. The Questionnaire can be found here. 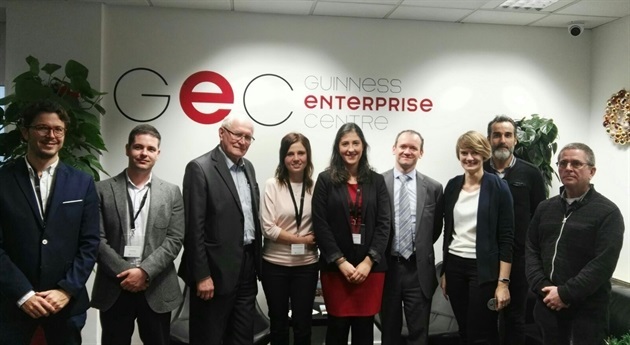 The 1st International consortium meeting of the Eramus+ project ETV4INNOVATION took place in Dublin between 13th -14th, December,2017. ETV4INNOVATION is a two-and-a-half-year long EC funded VET Strategic Partnership project under Erasmus+ programme. It has been designed with the aim to support the development and the implementation of an innovative practice and a new training path in the field of Environmental Technology Verification (ETV).The main objective of the project is to develop online training material in order to increase the knowledge of companies on the Verification of Environmental Technologies (ETV). ETV contributes to the protection and conservation of the environment by promoting and facilitating the adoption of innovative environmental technologies by the market, providing them credibility and reliability through an independent and impartial confirmation of the characteristics of these new green technologies. ETV4INNOVATION will promote knowledge about this verification among technology companies in order to promote a sustainable and reliable environmental industry. 1) Identify the lack of knowledge about ETV in order to manage and bet on compliance with the necessary requirements to request this verification. 2) Design and develop a Joint Curriculum for ETV with the participation of different interest groups from the sectors related to environmental technologies, experts in the field of verification of green technologies. 3) Create new job opportunities for people who acquire these new skills in the areas of production of environmental and sustainable technology, innovative processes in the industry and promotion of eco-efficient products. 4) Create awareness about current environmental problems, the need to carry out sustainable development and to carry out practices that are more respectful with the environment. 5) Train companies with the necessary skills and knowledge for the development of current and future green technologies and promote a sustainable procedure. The project involves project partners from Bulgaria, Denmark, France, Ireland, Poland and Spain. You are selling or looking for innovative eco-technologies? The innovative eco-technology performance verification ETV program is for you! The ETV program is an international scheme that delivers a performance certificate for innovative eco-technologies, whose validity is recognized and guaranteed internationally. The system relies on an independent verification body that verifies the performance claims of an eco-technology, by using certified test structures if necessary. The ETV scheme is for all vendors of eco-technologies, who will find in the ETV scheme the only internationally accepted solution that proves the performance claims of the technologies they market. The ETV scheme is for all buyers of eco-technologies (companies, local authorities and public authorities), who will find in the ETV scheme a unique solution to identifying innovative eco-technologies that meet their needs, while reducing their investment risk with the ETV performance audit report, which contains all credible and reliable performance data verified by a recognized third party. SMEs holding a technology that performs well above normal standards or that presents an innovative approach to solving an environmental problem can face market penetration challenges due to lack of independent and credible evidence of its advantages. Other stakeholders, such as purchasers or investors who are committed to using environmental technology solutions are often faced with non-comparable, incomplete or un-tested performance information when assessing the available market options. Environmental Technology Verification (ETV) provides an independent evaluation of new technologies with a view to validate environmental claims so that users, developers, regulators, and other parties can make informed decisions about purchasing, applying and regulating innovative technologies. Verification builds vendor credibility and buyer confidence by providing assurance that environmental performance claims are valid, credible and supported by high quality, independent test data and information. An ETV verification statement provides documentation that the technology you sell lives up to your promises - for instance, that it has a certain function or complies with specific requirements. This may be low energy consumption, a cleaner technology or high performance. The verification is recognised within the EU and in other countries as well, including Korea, the USA, Canada and China. The mutual recognition of an ETV means that you can market your products and use test results from one country when you promote your product on an international scale. Energy technologies (ex. renewable energy, energy from waste, energy efficiency technologies). Recycling technologies - of batteries, accumulators and chemicals, industrial by-products and waste into secondary materials, construction waste into building materials, Separation or sorting techniques for solid waste, materials recovery. FINANCED BY THE EUROPEAN UNION. THE EUROPEAN COMMISSION SUPPORT FOR THE PRODUCTION OF THIS PUBLICATION DOES NOT CONSTITUTE AN ENDORSEMENT OF THE CONTENTS WHICH REFLECTS THE VIEWS ONLY OF THE AUTHORS AND THE COMISSION CANNOT BE HELD RESPONSIBLE FOR ANY USE WHICH MAY BE MADE OF THE INFORMATION CONTAINED THEREIN.